SnowTours – Ski Trips FOR Skiers BY Skiers! | Costa Rica – Still More Monkeys than People Costa Rica – Still More Monkeys than People - SnowTours - Ski Trips FOR Skiers BY Skiers! In Costa Rica, the visitor can enjoy lovely tropical beaches, the grandest adventures, the wonders of nature, scintillating culture, all the necessary components of an ideal vacation. For Nature lovers, there is a great variety of exotic wildlife and tropical plants. Butterflies and orchids, crocodiles and sharks, turtles and Toucans´ are everywhere. The rainforest covering the mountains are a paradise for ecotourism. Life is good in Costa Rica, a friendly, democratic and peaceful country. For action vacation you can surf, hike, do rafting, canopying, diving, deep water fishing, and snorkeling. You can go with a low budget or seek the more exclusive resorts. For relaxation, there are beautiful unique golf courses and luxury spas. The hotels have all the modern comforts in the most private and secluded environments. Costa Rica has it all. 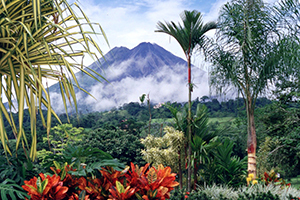 We do 5 and 7-night vacations, staying on the Pacific coast, with visits to Quepos and Arenal. The following excursions or activities are possible. Hike Manuel Antonio National Park, Canopy tour zipping from tree to tree, Dolphin watching, Whitewater rafting, Kayak the mangroves, horseback riding, sport fishing, jet skiing, and tours to the island volcanoes.